I'm more excited than usual to share this outfit with you for several reasons; the first of which being this necklace. I really love the mixture of the rich jewel colours with the pearls and gold framing. Next, these black, cat eye Miu Miu sunglasses with gold hardware are from Sunglasses Shop and are oh-so-perfect that I just want to wear them all day and all night. I want to wear them while I sleep. Bit weird maybe. Finally, I'm actually wearing flat shoes. I can't remember the last time I wore flat shoes in a blog post. I certainly don't 'dress up' for my blog, I wear the outfits I feature and I do wear low-mid heels almost everyday, but I'm trying to 'cut back' (so tragic) in preparation for my upcoming trip to Paris. I want to feel comfortable walking around all day, rather than being massively aware of my shoes - but generally I tend to feel a bit inelegant and lollopy in flats. It's just because I've become so used to how I look and feel in heels. I've brainwashed myself. Ridiculous, I know. I've now mentally filed this outfit as one to take with me on my trip - do you think I'll fit in on the streets of Paris? I heard a couple of weeks ago that to be stylish in Paris you have to be super skinny, blonde and only wear black. 0/3. In that case... do you think they'll even let me out of The Channel Tunnel? P.s. I'd also love some feedback on this new format - do you prefer my jabberings to come before the outfit images (as usual) or like this, with the images first and text afterwards? I'd love to hear your thoughts. Skirt & Belt : ASOS. Top : River Island. Shoes & Necklace : ZARA. Earrings : H&M. 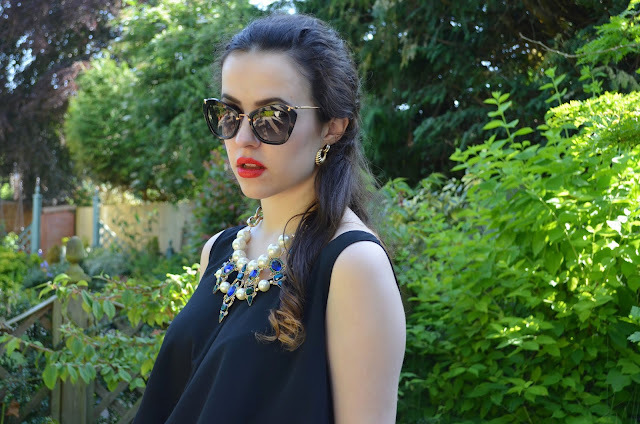 Sunglasses : Miu Miu c/o Sunglasses Shop. This outfit is GORGEOUS! Give me those sunnies, so gorgeous! I'm so jealous of your wardrobe. You seriously have the classiest of clothes and because of that I'm sure you'll fit into Paris perfectly! 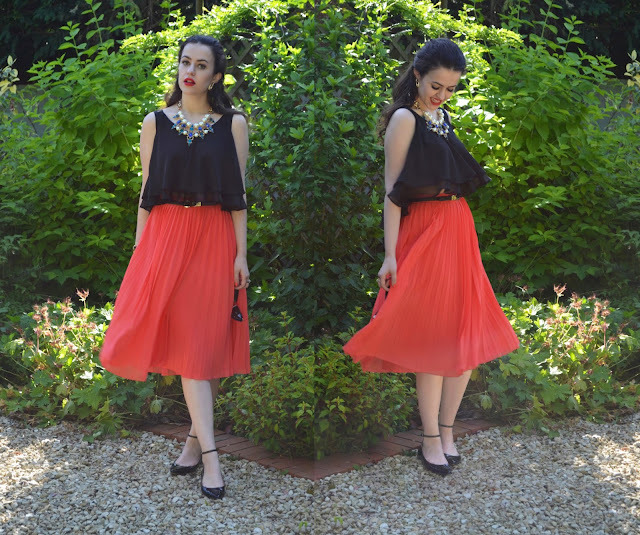 This outfit is so blissfully elegant -definitely Parisian chic! Absolutely stunning outfit. The skirt is gorgeous and the colour is simply devine. I love this skirt and that necklace is so pretty! Absolutely stunning as per usual. I love all of your clothes lady! Such beautiful pieces! I'd love to know where you forest floor midi skirt is from if you could? 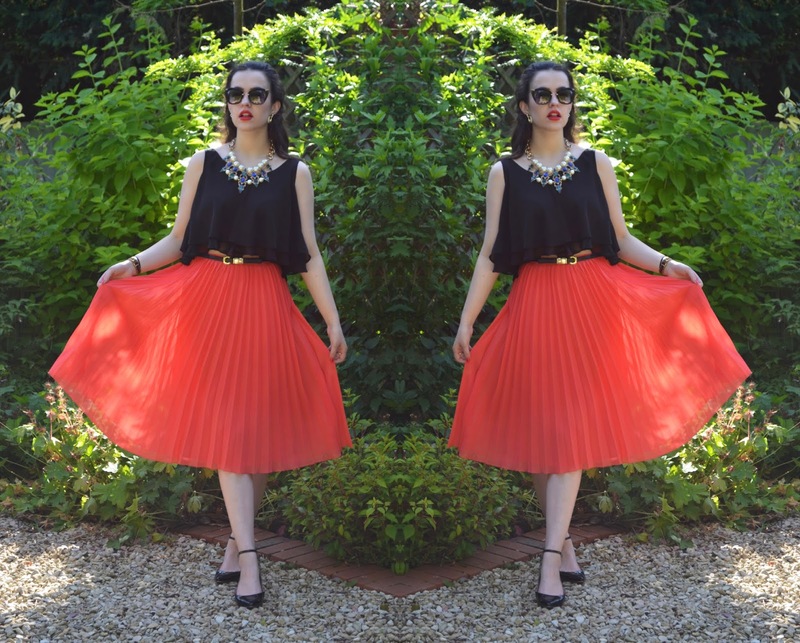 I have a slight obsession with midi skirts at the moment! Also, like the images first! you have such unique taste! All your outfits are so classy, I wish I could steal all your beautiful clothes! The skirt is amazing!I like red color. 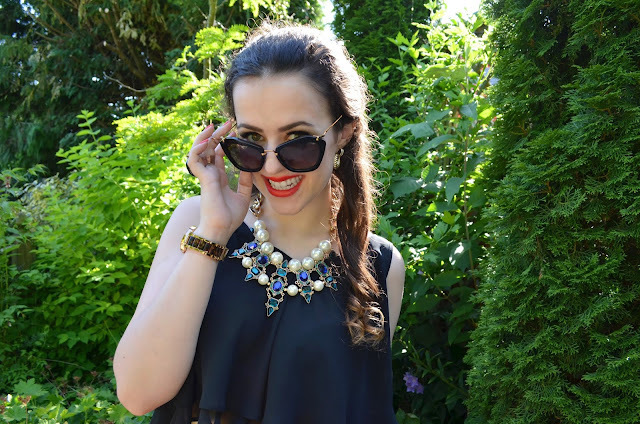 Love this outfit, especially the necklace! 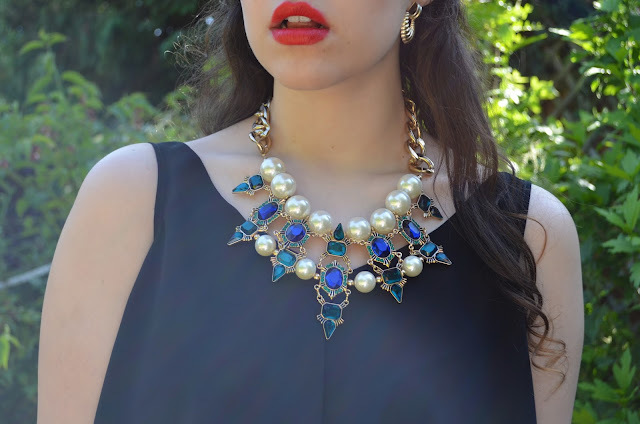 I really need more statement jewellery in my life! 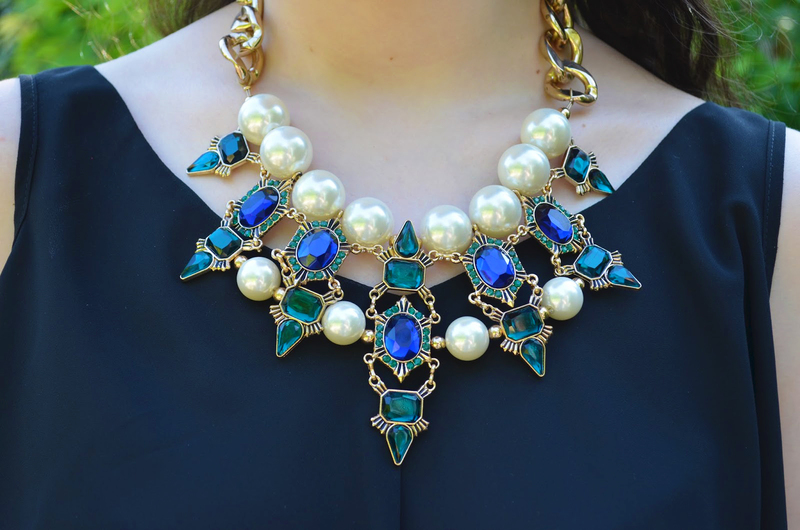 you look really elegant in this outfit and nice statement necklace!